Finishing a guitar takes a lot of time, often as much time as all the rest of the building process. Whether lacquer, varnish or oil, a guitar’s finish really serves one main purpose: to protect the wood from harm, and to keep on protecting from harm for as long as possible; and failing that, to be able to be repaired as seamlessly as possible. There is only one way to tell if a varnish will last for centuries, and that is to wait a few hundred years. This means that in order to be sure of the integrity of the varnish over the long run, we have to look at old varnish, specifically that of old instruments. There is a lot of hype and mysticism surrounding the composition of the varnish on old violins, and many different recipes and secret formulae to try and re-create it. The tonal quality of the best old violins has often been attributed to its varnish, of all things. This quaint assertion has developed into an enduring myth; it is nonetheless, as most contemporary luthiers are aware, a myth. Spirit varnishes are those that consist of solids dissolved in a solvent. When the solvent evaporates, the solids are left behind as a thin film. It is usually quick to dry, easy to polish, and new coats “melt in” and combine seamlessly with the old. Old guitars, lutes, harpsichords, and just about every other article not intended for the outdoors use this type. Oil varnishes consist of resins cooked together with drying oils. Upon application, these react with the oxygen in air to create a tough and durable coating. Good for carriages and caskets, not so good for fine acoustic instruments, though for some reason many violinmakers (and only violinmakers) disagree. Since a guitar is more closely related to a harpsichord, lute, or an older guitar, I am only interested in spirit varnishes. The chemistry of even simple spirit varnish recipes was not well understood by their writers. It is common for them to indicate that one should add a softer resin to give plasticity to a harder one, and thus to create a final product that does not crumble or flake but still has the required hardness to be easily applied and polished to a good sheen. It may look good and be easy to apply for the luthier, but ignores the fact that the different resins will potentially react chemically together in new and unexpected ways over the years, eventually crazing, flaking, or even powdering off. Frank Hubbard’s book “Three centuries of harpsichord-making”, describes several such recipes used for varnishing the soundboards of harpsichords, and points out Lorenz Mizler’s “neu eroffnete musikalische bibliothek” as containing the formulation used by the violinmakers of Cremona. I obtained a facsimile of the chapter pertaining to violin varnishing and had it paraphrased from old German into English. 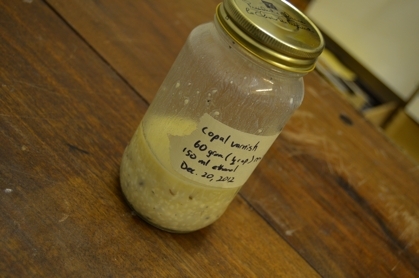 It gave instructions on how to produce a very simple copal-based spirit varnish, and asserts that this was the very same recipe used by Jacob Stainer. Though Stainer worked in Austria, his violins were in their day regarded as highly as those of Amati and Stradivarius; indeed, it is possible that he studied in Cremona with Nicola Amati himself. This, though, is beside the main point: that the varnish of his violins has survived in excellent condition despite centuries of service. Going forward, we must bear in mind that encyclopeadists like Mizler were not uncommonly wrong about many subjects, occasionally even being deliberately mislead by their sources in order to keep trade secrets secret. We will press on and hope for the best. At least his instructions are as clear as they are simple: First, we must buy “Gummi Copal”. Next we get some “Hungarian wine spirits”, with the warning that any other spirits will cause the varnish to be cloudy, or “bloom”. We are told to add the wine spirits to the copal gum, wait a few days, and then to strain the solution to remove any foreign matter. It was to be applied with a horsehair brush, although any fine-haired brush would undoubtedly have worked. If, despite using the finest Hungarian wine spirits, the varnish was still cloudy after application, it could sometimes be ameliorated by gently warming the instrument in front of a fire. These instructions are familiar to anyone who has used shellac for fine furniture or instruments, although the application of shellac is more often done with a pad (the “french polish” technique) rather than a brush. 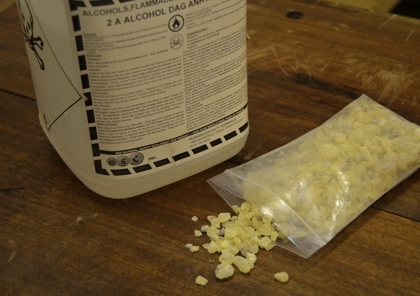 Since we are not given any units of measurement or proportions in Mizler’s recipe, I will presume that shellac-like proportions of the two ingredients will give similar working properties: 220 grams of resin to 1 litre of alcohol would be a standard shellac mix, thinned down with extra alcohol for the first sealer coat. “Wine spirits” means ethanol (alcohol produced by the fermentation of sugars- that’s the stuff we drink- and purified by distillation), and the cloudiness he is describing is what happens if the ethanol used is not pure enough; that is, if it contains too much residual water. Anything with less than 90% alcohol is liable to bloom, but with standard distillation techniques the best that can be achieved is about 95%, hence the admonition about using the best spirits you can get. Just to complicate thing, some old recipes (Mackenzie's Five Thousand Receipts: In All the Useful and Domestic Arts, Colin Mackenzie, 1831) refer to something called “Hungary water” as being pure alcohol (distilled three or four times) infused or distilled with rosemary, sort of like strong gin. This could mean something. The dried leaves and flowers of rosemary contain a substantial amount of camphor, a turpenoid that is used as a plasticizer in lacquers, and is known to improve the solubility in alcohol of some resins. However, “Hungary Water” is only ever mentioned as a tonic and a perfume. Moreover, early formulations of nitrocellulose lacquer that used natural camphor are notorious for developing an ugly, rough surface years later. “Hungarian spirits” is more likely to refer to absolute alcohol, distilled from whatever source is at hand. The practice continues in eastern Europe to this day: itinerant pedlars with portable stills travel the countryside for hire, producing spirits from a farmers’ fermented plums, cherries or mulberries to drink; spirits from fermented potatoes, carrots (or whatever else) for cleaning wounds and carburetors. Fermented grapes would be most likely to produce pure ethanol with very few byproducts, hence Mizlers specification of “wine spirits”. He also says specifically not to add any turpentine or other such solvent, and not to heat the solution. This clearly indicates that we only want to use the elements of the resin that dissolve completely in room temperature alcohol. The ingredient “Gummi Copal” presents a difficult problem though. Over the years “copal” has been the name applied to a large number of different resins, most often semi-fossilized tree sap. We need to know precisely what Mizler was referring to. To narrow the list down, we can eliminate any resins that do not dissolve substantially in room-temperature ethanol: out go the semi-fossil resins, Zanzibar Copal from east Africa (though soluble in alcohol when fresh, it was almost always sold in aged, insoluble form), and the resin of the Sumac Rhus Copallinum. We are left with at least three possibilities, all of them freshly tapped tree resins: Manila copal from Agathis Phillipensis, Kauri gum from Agathis Australis, and South American Copal from the Jatoba tree, Hymenaea Courbaril. Of these, Kauri gum would certainly not have been available to violinmakers of the 17th century. Since tree resins were (and still are) often used in pharmacology, I have been able to find a medical reference (Lectures on the Materia Medica: Containing the Natural History of Drugs, Their Virtues and Doses, Charles Alston, 1770) that clarifies things. Though it is typically (and confusingly) called “Gum Anime” in the English-speaking world, what was called “Gummi Copal” on the continent is always one of the resins from “new Spain”, and usually specifically from the “Portuguese Courbaril”. In addition another medical text, though even less contemporary with Mizler is more explicit about the confusion in nomenclature, and of which one we want: “from hymenea courbaril: used to make spirit varnish: soluble in alcohol.”(A supplement to the pharmacopœias, Samuel Frederick Gray, 1828). In other words, our mystery ingredient is the resin tapped from the Jatoba tree, which grows commonly in central and south America. It has since time immemorial been used as an incense and medicine by the indigenous people wherever it grows, and has been an important article of trade for the region since the conquest. Even today it is obtainable from aromatherapy and natural incense suppliers. Our wine spirits no longer have to come from Hungary, but can be picked up at the local hardware store. The next step is to try making it. I've mixed up a small batch (here it is after one day), so in a couple of weeks I'll be able to start testing it. I'll let you know how it works.